They say that good design is timeless. And in the world of cars and automobiles, you’ll know that a design transcends time when you take that car design decades after its creation, put it side by side with the newest car in a local showroom and you’ll see that the old car would still look as cool as if it just rolled out the production line. Here are some examples of innovative car designs that were ahead of its time; and even now strike awe and admiration not only from car enthusiasts but even ordinary people who just happen to see them speed by. The Ford GT40 is the high performance sports car which won Ford the 24-hour Le Mans Race four times in a row from 1966 to 1969. The name GT40 represents the car class it belongs to – GT (which stands for Grand Touring) and the number 40 to represent its overall height of 40 inches. The car used large displacement V8 engines made from Ford as opposed to the V12 engines that its rival – Ferrari were using. This almost 50-year old car has design cues that are really ahead of its time. 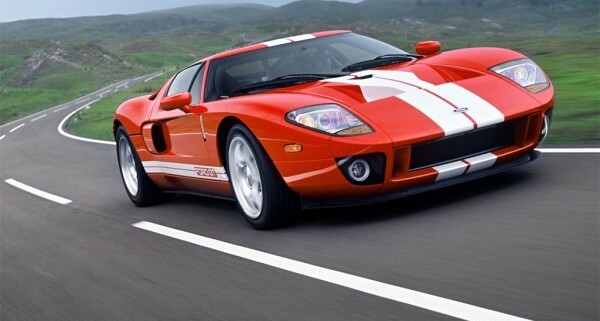 And if you place it side by side with the 2003 Ford GT (a mid-engine sports car inspired by the GT40) an untrained eye would probably see no difference between the two. Another revolutionary design from the 1960s is from the Italian carmaker – Lamborghini. The Miura was a two-seater mid-engine high performance sports car that was made from 1966-1972. It was the grandfather of all Lambo designs from the Countach, Diablo, Murcielago and Gallardo. In 2006, a re-styled Miura concept debuted at the North American International Auto Show in celebration of the 40th anniversary of the introduction of the original Miura in the 1966 Geneva Motorshow. The Mercedes Benz 300SL was a two-seater sports car which was first introduced by Mercedes Benz in 1954 in the New York Auto Show. It’s most distinctive feature is the iconic gull-wing doors, which was an innovative design that makes use of doors hinged on a car’s roof instead of its side. In 2010, Mercedes Benz released a new car that they dubbed as the spiritual successor of the 300SL – the Mercedes Benz SLS AMG. The car features the same two-seater design as well as the gull-wing doors found on the 300SL. Another Le Mans car that exhibited innovative design elements would be the Porsche 917 built in the 1970s. Although it was very successful in the Le Mans, it did suffer from poor build quality especially in high speeds but nevertheless, its design was still considered as avant-garde even in today’s standards. In 2009, Porsche held a special birthday party celebration at the Goodwood Festival of Speed to commemorate the 40th anniversary of the 917. The Esprit was a sports car produced by British car manufacturer Esprit in 1976-2004. It was designed by famous Italian automobile designer Giorgetto Giugiaro and featured the artist’s polygonal “folded paper” design. However, the car’s popularity came when it was used as a James Bond car in the 1977 film The Spy Who Loved Me. Lotus is planning to release a redesigned version of the Esprit in 2013. The design was debuted at the 2010 Paris Motor Show along with four other cars in the company’s lineup. The DeLorean DMC-12 was the iconic time-travelling car in the Back to the Future movies. But in reality, the DeLorean is a sports car manufactured by DeLorean Motor Company for the American market in 1981-1982. Just like the Mercedes Benz 300SL, this car also has the iconic gull-wing doors; and just like the Esprit, it was also designed by Giorgetto Giugiaro. Among the estimated 9,000 DeLoreans ever built, only 6,500 are believed to still exist today. The F40 is one of the most celebrated cars in the production history of Ferrari. It was first produced from 1987 to 1992 and had an estimated retail price of $400,000. The F40 is a mid-engine, two-door coupé sports car designed by Italian design firm Pininfarina. The F40 was intended to be the best car ever built by Ferrari, encompassing the best technology and engineering techniques of the time as envisioned by the company’s founder – Enzo Ferrari. The XJ220 was a two-seater, mid-engine supercar produced by Jaguar in 1992 and 1994. It was made in collaboration with Tom Walkinshaw Racing and was intended to compete with the Ferrari F40 and the Porsche 959. The XJ220 was produced in a purpose-built factory in Bloxham, England with the first units delivered to customers in July 1992. The XJ220 held the record for the highest top speed attained by a production car in 1992-1994 until of course the arrival of the next car on our list. The McLaren F1 was the definitive supercar of the 1990s. The car was designed by Gordon Murray and Peter Stevens and sports a number of noteworthy features not available even in today’s more modern cars. For starters, the McLaren F1 uses a multitude of expensive and exquisite materials like carbon fiber, titanium, magnesium, Kevlar and even gold for body parts and components. The seating arrangement of the car is also uncommon, with the driver seat positioned in the center of the car while the two passengers are placed behind the driver. This puts the driver of the car in a unique position that provides maximum visibility very much like that of a fighter jet. Only 106 units of the McLaren F1 were manufactured with an initial price tag of $940,000. In today’s market, these cars can now sell at double its original price due to its performance and rarity. And there you have it. What’s your favorite design? Tell us by leaving a comment below. You can also leave a message on our Facebook, Twitter or Google+ profiles. Lastly, please do subscribe to our RSS Feeds for more inspirational articles as well as practical tips and news stories in the world of design.